“Ain’t Too Proud – The Life and Times of the Temptations” fired up the crowd at its Los Angeles debut Friday, Aug. 24, at the Center Theatre Group’s Ahmanson Theater. “Ain’t Too Proud” tells the story of one of the greatest R&B groups of all time, The Temptations, who yielded a bumper crop of sensational songs in the glory days of Motown Records. The show is directed by Des McAnuff, who previously mined pop band history with “Jersey Boys.” Woven in-between and sometimes during songs is Dominique Morisseau’s book, which is derived from the memoir from Otis Williams, the only surviving original band member, who was in attendance Friday. Told from the perspective of Otis Williams (Derrick Baskin), the group’s story is familiar and similar to a lot of successful early Motown acts. Motown founder Berry Gordy (Jahi Kearse) guided the Detroit-based group’s rise in the 1960s as a smooth vocal quintet with the aid of a talented stable of songwriters including Smokey Robinson and Norman Whitfield. They encounter racial music prejudice at a time when even radio was segregated. Gordy kept their sound sophisticated and tame (1965’s “My Girl”). He emphasized that “music is colorblind, but the world isn’t”in efforts to integrate the charts and radio play lists with his acts. Eventually, conflicts arise over money, artistic control, and addictions. Issues escalate with the tormented, strung-out David Ruffin (Ephraim Sykes), quick-tempered Eddie Kendricks (Saint Aubyn), alcoholic Paul Williams (James Harkness) and arthritic Melvin Franklin (Jawan M. Jackson). Ultimately, as Otis relates, it seemed like “’The Tempts’ stood for ‘temporary. '” While the original quintet is considered to be the definitive lineup, there have been 24 members of The Temptations in the past six decades. The diverse blend of voices set the Temptations apart, and the cast here does them proud. As the lead singers, Pope echoes Kendricks’ astonishing falsetto, and Sykes displays a pleasant baritone with his incredible dance moves. Baskin serves as the musical’s emotional and musical center, while Harkness adds depth to the harmonies. Lastly, Jackson’s effective bass is highly reminiscent of Franklin’s. The sets by Robert Brill also add to the action. Part of the stage rotates, which helps create an on-stage versus back-stage illusion when the band is supposed to be performing live. Also, the set uses a conveyor belt, most effectively to move original band members out and substitutes in. Yield to temptation and see “Ain’t Too Proud” during its Los Angeles run, which ends Sept. 30, or in Toronto’s Princess of Wales Theatre from Oct. 11-Nov. 17, 2018. 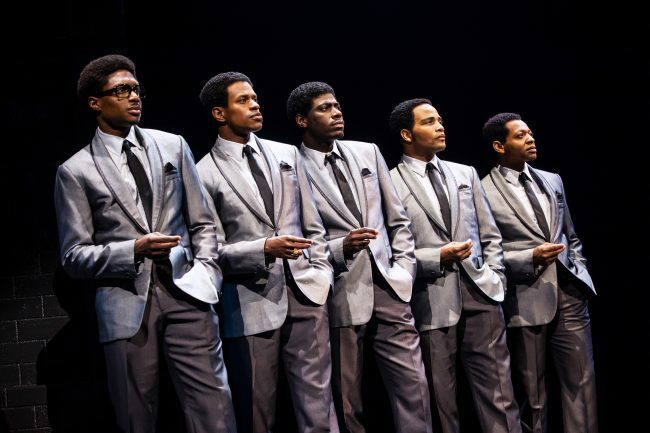 After that, the show and the life and times of the Temptations will open on Broadway in Spring 2019, but open dates have not been announced. Photo by Matthew Murphy of (L-R) Sykes, Pope, Jackson, Harkness and Baskin in “Ain’t Too Proud,” at the Ahmanson Theatre through Sept. 30.